We made the most of the ANZAC day long weekend and flipped Elena back the right way up, onto the cradle we made. This time we dispensed with the ropes. I lifted it off the sawhorses using a trolley jack at either end, and dropped it on some enormous (wimpy) camping mattresses. 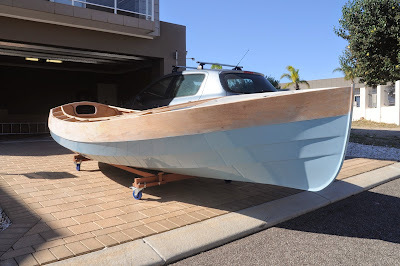 Then Perry and I grabbed a gunwale and lifted. Once it was balanced on it's side I nipped around the other side to lower it onto the cradle. Really quite easy. Here she is sitting out in the sun while I tidy the garage, which was starting to look pretty sad. 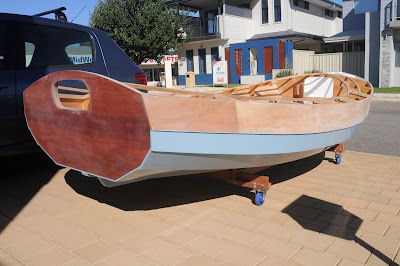 I'm indebted to Peter Sibley from the wooden boat forum for the Penetrol tip. I'm really pleased with how the bottom paint has turned out. Boats look rather more proper the right way up. Looks fabulous, you must be itching to get her in the water. Can't believe you've done so much in a year. The second pic shows a nice cabin setup... Congrats on the progress.